I know I keep saying this, but I truly cannot emphasize enough how beneficial reading through the Bible chronologically together has been. My children have a greater understanding now of not only these first books that we've read together already, but also understand the reasoning behind so much more of what happens in the Bible. This time together is something I will never regret. Sunday night we were honored to have my dear friend's son over for the evening. 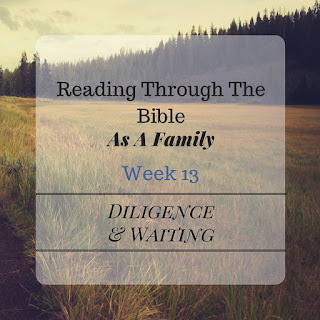 When it came time for family devotion, I wasn't sure how well everyone would take to stopping all the excitement of the visit and settling in for a devotion time. However, each time this young man has stayed with us over the years we've always included him with our devotion time before bed. This was started at church camp when my husband was the cabin leader the first year they went to camp! So, it was a tradition that was kept each time this young man came over for a visit. Having him join our family devotion time was a special treat this week. He even shared a little with us about his family's devotion time together. Having our friend with us did not slow the questions or comments down for the evening either. Our hearts were full with God's Word, family, and fun fellowship with friends. This week we finished Numbers and began to dive into the book of Deuteronomy. Numbers ended as almost a cliff-hanger. As the kids put it, we're waiting on Moses to die and the Children of Israel to cross over Jordan! But still in the first part of Deuteronomy we find Moses and the children of Israel still waiting. We know we are so very close to the prize the anticipation is quite thick! But Moses still had wisdom and commands from God to share with the children of Israel before they were ready to see their promised land. Throughout the book of Deuteronomy, the word diligently is used. Merriam-Webster defines the word "characterized by steady, earnest, and energetic effort." Diligent is a word I use with my children quite often. "Are you working diligently?" It is quite the opposite of laziness! And thou shalt teach them diligently unto thy children, and shalt talk to them when thou sittest in thine house, and when thou walkest by the way, and when thou liest down, and when thou risest up. What this says to me is God expects me to earnestly teach my children God's Word. The word earnest implies a serious consideration. I have to put for effort and energy. I'm not to expect them to learn everything they need from church, youth group, or anyone else. I'm to make it my responsibility, my desire, to see that I share with them about the Lord, about God's Word, even testimonies of what He has done for me and our family. The verse even describes when I am to do this - when we are sitting at home, when we're out walking (or driving in the van), at bedtime and in the morning. Basically, at all times In our daily lives. The chapter does go on to discuss HOW we are to do this. Moses begins to describe the type of relationship we are to have with God. The type of relationship we have with the Lord will impact the type of relationship we teach our children to have with the Lord.